Stitched on black 28 count Quaker Cloth with HDF "Tugtika" silk thread. Started in March but not finished until April. Stitched over one on 28 count Natural Cashel linen with DMC threads and finished as a pinkeep. Started 23 April 2008. Finished 29 April 2008. A quick stitch for April! on 32# Dirty linen with recommended DMC threads and embellishments. 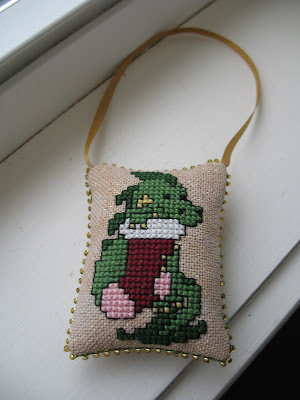 I like all the designs in Tiny Tidings IX and plan to stitch them all. My first attempt at Colonial knots, not very successful but I'm happy with the effect. I was able to get this stitched on Sunday. Just in the nick of time. I substituted fibers for what I had on hand. 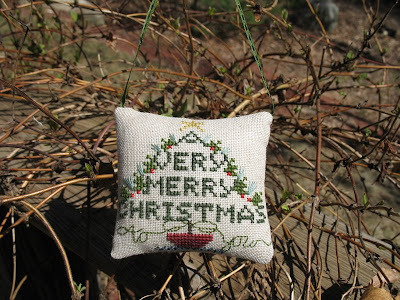 The falling snow did not show up well, so I may stitch this one again on a different fabric. I stitched this one up this weekend. Luckily I started early on Thursday night as it took me all that time to finish! 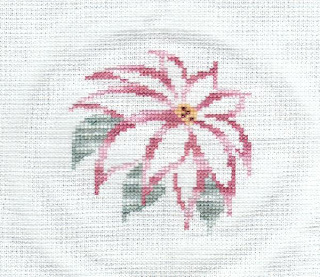 I'm back to stitching ornaments again, and on a poinsettia kick. 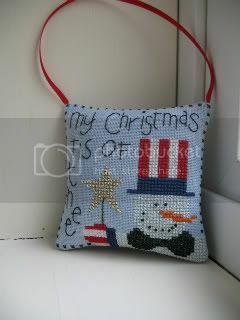 Have scoured all my JCS Ornament Special Issues looking for the charts, here is the first one to be stitched. It went quick! I just started it yesterday evening, and now it's done. 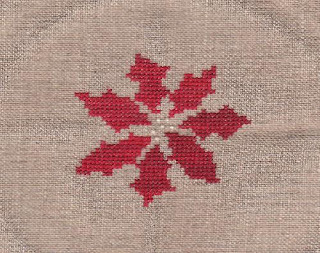 The designer is Samplers and Such, and it appeared in the 2005 JCS special issue. These are Feb and March ornament, i always forget to upload it here. Feb. ornament Woodland Snowfall, is a LHN designs featured at JCS 2004. Stitched on 32ct linnen and used DMC threads. This is a blackbird designs, featured at JCS 2004. Stitched on 32ct linnen and used DMC thteads. Christmas Angel by Midsummer Nights Designs, featured at JCS 2007. Here is my ornament & card for April. The poinsettia is from the JCS 2007 Christmas Ornaments Magazine by Brittercup Designs. Stitched on 28 count antique white Jobelan with DMC threads. I'm not quite sure how I will 'ornamentise' it yet, maybe a wee pillow. The card design is a freebie from www.cross-stitch-directory.com stitched on 25 count evenweave with DMC threads. I didn't realise that we could add in easter theme ornaments too, but while I was looking through, I saw a couple more, so decided to add this one I made for an exchange . Stitched with DMC on a piece of 28ct fabric. I finished this one the other night when I finally received the packet of beads I needed to put on the last 10 beads! 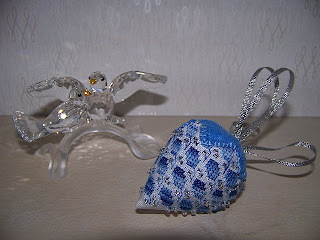 The ornament is the Victorian Lace Snowflake from the JCS 2007 Ornaments issue by Karen Kluba of Rosewood Manor. I used stuff from my stash----mystery cloth, metallic variegated DMC and Mill Hill beads 03003 instead of the materials called for in the pattern. Here is my Ornament finish for March. Plz don't laugh at my finishing skills. LOL This was my first attempt at making a finish like this. Everyone's ornies are very very nice! It inspires me to work on some of the designs that I have in my stash as well. Happy Stitching!! This is my ornie finish for March. 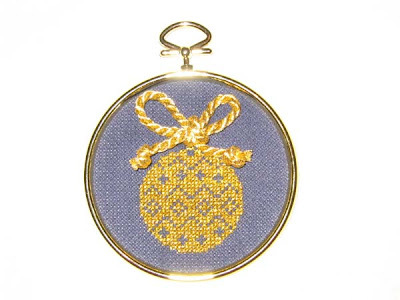 It's from JCS 2007 Ornament Issue. It's by Designs by Cathy Jean called "Fill with Love".